HPA recently completed a customer service survey among monthly and daily parkers at the MAT Garage, which has entrances on South Chapel Street and Church Street. Parkers were asked to register their level of satisfaction with the facility in several categories, including customer service, ease of finding a space, cleanliness, signage, ease of exiting and payment, security, and overall satisfaction. 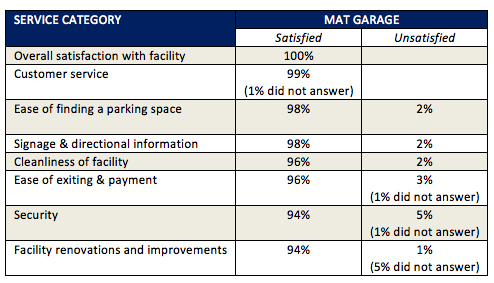 Among the highlights, 100% of customers surveyed indicated that they were either very or somewhat satisfied with their overall parking experience at the MAT Garage, and scored customer service highest (99%) among the attributes. “We hold the opinions of our customers in high regard and this survey data provides valuable information on areas where we’re meeting or exceeding expectations, as well as those where we can continue to improve our facilities and the parking experience,” said Mark K. McGovern, CEO of HPA. If you have an opinion you’d like to share, please give us a call at (860) 527-7275 (our office hours are Monday through Friday from 8:00 a.m. to 5:00 p.m.) or send us a fax at (860) 549-7275.